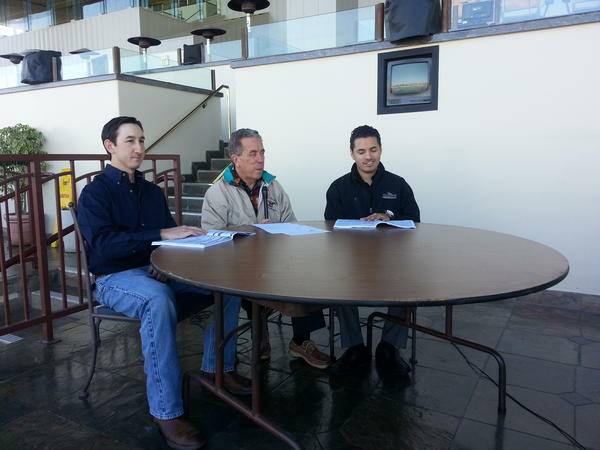 Curtis Treece (Equibase Chart Caller), Ed Burgart (Track Announcer), and Me. What: 14 Trials to the GI $1,111,000 Ed Burke Million Futurity. Who: 112 talented 2-year-olds. The ten fastest qualifiers return to run in the final on June 23. What to look for: The majority of these runners have been competing at 300-yards, make sure to look at the running lines and comments to find those that have made a late run. Those should benefit from today's 350-yard distance. Also look at the workouts and odds that some of these runners went off as in their previous starts, that might be a good indicator if they were well meant and you might find a better price today. Usual suspects: Look for these trainers to have plenty of live runners with their top riders: Jones (Sanchez/DeAlba), Flores (Mendez), Willoughby(Aceves), Morales (S Mendez), Glenn (Gomez), De La Torre (Nicasio/Arriaga), Gomez (Aceves/Arriaga). These are some of the combinations that have a good amount of runners today and tend to be in the money at a high percentage. Look for these when building trifectas & superfectas. Should be a great night of racing!